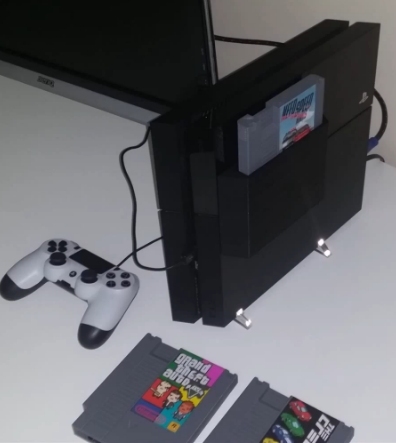 A modder of a certain kind of skillset has gone out of his way to mod his PlayStation 4 to enable it to run current generation games... from NES cartridges. If it sounds kind of strange and out there, well that's because it kind of is. 3DPrint has a nice little article detailing how modder Frank Zhao turned his PS4 into a cartridge-playing machine. Using a Ultimaker 2 3D printer, Zhao managed to physically print out replicas of the original Nintendo Entertainment System cartridges. He used a normal 2D printer to make the labels for the games, and he designed a custom sleeve on the side of his PS4 that reads the cartridges. If you're wondering how this actually works, well, there's a bit of trick to it. You see, the games aren't really stored in the cartridge in the traditional sense. They're not running as discs or on plastic circuit boards. The games – PS4 titles such as Grand Theft Auto V, The Crew and Need for Speed: Rivals – are actually stored on SATA hard drives. The hard drives are then encased in the 3D printed NES replica cartridges. If it sounds complicated that's because it is. Essentially the SATA sleeve annexed to the PS4 like some kind of protuberant appendage, works to read the data of the games that are stored on the small hard drives. It's almost the equivalent of playing games from SD cards or USB sticks... except... there's a giant SATA reader attached onto the side of the PS4 like some kind of console Frankenstein. You can see it in action with the video below. Call me crazy... but wouldn't it have been easier just load the games onto a USB compatible 2.5” hard drive (like this one right here), strip open the HD case, envelop the PCB inside a 3D printed NES replica cartridge, and then use a USB extender (like this one here) to hook into the hard drive encased within the cartridge? With the extra cable length from the USB extender could a fake housing not be made for convenient plugging in and unplugging of the cartridges into the PS4's USB slot? Would that not have been the easier and more convenient way to do it? Or am I missing something? Anyway, the method Zhao used isn't easily repeatable or doable for the average gamer. So even if you had a 3D printer to make the NES cartridge replicas, and even if you had the skill to print out your own 2D labels for those cartridges, and even if you did manage to have spare SATA hard drives where you could load up the game, you would still have to do the whole PS4 motherboard manipulation. I think it's safe to say that most gamers will likely stick to an actual NES (or emulators) to get their fix. Nevertheless, you can learn more about the process by paying a visit to the official 3D Print Board forums.